Just like your favorite late-night diner food, but without all the grease! 1) In a small bowl, combine the egg and mustard. On a plate, mix the flour, flaxseed, and salt and pepper. 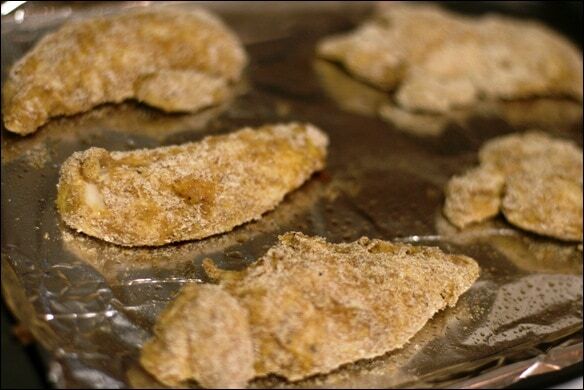 2) One by one, dredge the chicken tenders in the egg/mustard mixture, then in the flour mixture until fully coated (shake off any excess). 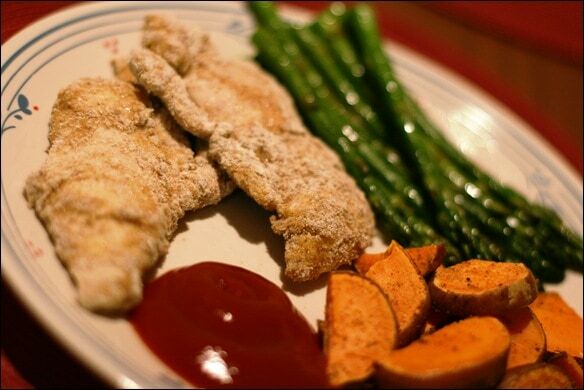 Place the coated tenders on a cooking sprayed or nonstick baking sheet. 3) Bake at 375 for 12 to 15 minutes, or until golden brown. Click here for the original post with lots more photos and commentary! Thanks, Mari! Unfortunately I don’t have the nutritional information for my recipes. I’m sorry! If you calculate any of it, let me know and I’ll add it in. Mari- Just a tip if you haven’t found this out already. I’ve been using Sparkpeople for a while, and sparkrecipes.com has a nifty recipe calculator! I use it all the time to calculate recipes I find on blogs :) Hope that helps!